In the same way that everyone in the church is, or ought to be, a worshiper of God, everyone is also a minister of God. Those who lead musical worship aren't putting on a performance or doing all of the worshiping for the congregation. Rather, they are leading the people in a worship response of their own. Likewise, ministers, particularly paid pastors, aren't paid to do all of the church's ministry. Rather, like lead worshipers, their job is to lead (disciple, train, equip) the people as ministers of God. A common misconception among churchgoers (clergy and laity alike), which may be a reason for so much pastoral burnout, is that the job of pastors mostly has to do with taking care of churchy tasks, especially focusing on Sunday morning execution, and little to do with building up a church of ministers to do the work of God. Why is this, when Scripture is clear that all followers of Christ are ministers? "But you are a chosen race, a royal priesthood, a holy nation, a people for his own possession, that you may proclaim the excellencies of him who called you out of darkness into his marvelous light. Once you were not a people, but now you are God's people; once you had not received mercy, but now you have received mercy" (1 Pet. 2:9-10). The people of God are His royal ministers, each and every one of us. So why is it that so many "Christians" (churchgoers) don't see themselves called to be ministers of God? I think a major reason is that the separation between clergy and laity has gradually become so wide that oftentimes clergymen get exalted far above laypersons in calling, duty, influence, and expectation. We must alter our perception here and understand clergy and laity as equals in the Kingdom of God if we're going to close the gap. Both clergymen and laypersons are followers of Christ and ministers of God. The only difference is clergymen are usually paid, and they're responsible in God's eyes for leading and training laity to minister the gospel to the world. "And he gave the apostles, the prophets, the evangelists, the shepherds and teachers, to equip the saints for the work of ministry, for building up the body of Christ "(Eph. 4:11-12). Realistically, if it were merely my job as a paid pastor to plan and execute Sunday morning Celebrations, I would work ten to fifteen hours a week and use the freed up budget money to pay my would-be volunteers. If Sunday morning is all there is when it comes to ministry, then churchgoers are right to simply check church attendance off their list every week and expect the paid ministers to do all the work. But that's not my job, and that's not what the church is or what it does. The church is the means by which the gospel will go out to the ends of the earth, not solely through the work of the paid pastors, but through the church, those who are being raised up as ministers of the gospel. So that through the church the manifold wisdom of God might now be made known to the rulers and authorities in the heavenly places" (Eph. 3:10). Who Gets to Narrate the World? I just started reading Bob Webber's final book, Who Gets to Narrate the World: Contending for the Christian Story in an Age of Rivals. In it he shares his thoughts on what he deems the most pressing issue in the world and the evangelical church today: the external threat of Radical Islam to the Christian Story, and the internal threat of a culturally accommodated American church that he fears will not be able to stand up, spiritually, against the growing evils of Radical Islam. "The church has been influenced by current business models, by market-driven advertising and by the spectacular. The consumer model has especially affected worship, which is the true measure of the church. Jesus has become a product to sell, and worship is the primary channel for sales. Most churches do provide more in-depth Christian instruction in small groups and home studies. However, there are a good number of people who never get past the window dressing of worship entertainment, where they continually feed on pabulum rather than the meat of God's Word and sustenance of communion. The substance of worship - remembering God's saving deeds in the past, culminating in Jesus Christ, and anticipating the overthrow of all evil at Christ's coming - has been lost" (18). "True worship relies on both feeling and understanding, or as Jesus said, on spirit and truth. Worship that is devoid of feeling and emotion will be dead worship, for the God we serve is worthy of feelings that express His worth. He evokes these feelings in those who love Him. It is the very height of hypocrisy to pay lip-service to God when I do not truly feel affection for Him. At the same time worship needs to be thoughtful. While it engages my feelings it must also engage my mind. My feelings must have their basis in what I know about God so that the more I know about Him the greater will be my feelings of affection for Him." Bob Kauflin is the Director of Worship Development for Sovereign Grace Ministries. He is quite insightful when it comes to the subject of worship. His blog, Worship Matters, is one of the few I frequent. Well, I just listened to most of a very long interview of Bob by Mars Hill Worship Pastor Tim Smith. You can watch and listen to the whole thing here (it's about 1.5 hrs. long), or, throughout my highlights below, you can go to Bob's blog and listen to the short interview snippets he chose. "You yourselves like living stones are being built up as a spiritual house, to be a holy priesthood, to offer spiritual sacrifices acceptable to God through Jesus Christ." "Keep your conduct among the Gentiles honorable, so that when they speak against you as evildoers, they may see your good deeds and glorify God on the day of visitation." Bob notes that our sacrifice of worship is living our lives among the pagans in such a way that they will glorify Christ when he returns. So, Bob's goal in leading worship isn't to create a mere experience for worshipers, musical or otherwise, but to build up the community of worshipers so their entire lives, both in and outside of the church gathering, will please God and testify to others the glory of Christ, so that they might glorify Him in return. Next, Bob briefly touches on physical expression in worship. I would highly recommend taking the time to listen to Bob's snippet here (6.5 mins. long), so that you can see the passion with which he answers this question. In a nutshell, Bob says, "We want to demonstrate, in a way that has integrity, in a way that is reflective of the culture we come from, that Jesus Christ is worthy of our deepest, purist, and strongest emotions. If who He is an what He's done - the fact that He became a man, lived a perfect life, died as a substitute in our place, rose from the dead, ascended to His Father's right hand, where now He intercedes for us before the throne - He is worthy of affection, emotion, expressiveness..."
1. Music is a god, has the power to control us, and serves as a source of satisfaction in itself, used almost like a drug. In many churches, musical worship has be come a fix. It is an idol. 2. Music is an enemy, it is so powerful we have to minimize its effects: no instruments, awful sounding, unattractive, just to make sure no one in this church is going to fall victim to musical masochism. 3. Music as a servant, or friend. It is a gift from God designed to develop and deepen our relationship with him and with each other. What people notice in your music is the glory of Jesus Christ. Your excellence is used to serve the church. That should be enough to chew on for a while. Overall, I found this interview to be very helpful in my understanding and practice of worship. I hope it does the same for you. Although I do have a few worship songs within which I whistle, that is not what I mean when I speak of whistling while you worship. What I mean is having a Christ-centered, worshipful attitude of heart when doing anything and everything in life. 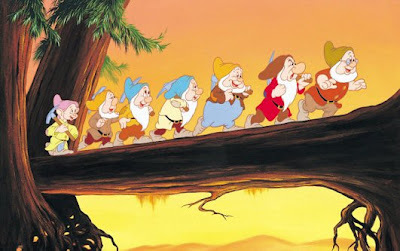 Imagine if all Christ-followers had the same positive attitude in everything as the seven dwarfs had while they worked. Okay, not the fairest comparison, but catchy enough. And yes, this is another of my attempts to expand the common Contemporary Christian understanding of worship from singing songs to a Spirit-led lifestyle of participating with Jesus as He glorifies our Father in all things. I begin this series with the one everyday activity I have the most trouble doing in a Christ-like way - driving. I hope you're not the person who flies by me in your SUV at 55mph in a 35mph zone, because if you are I've probably cursed you. And I'm sorry for slandering you, "Miss I don't have enough time to put on my makeup at home so I must proceed to apply it in the car and forget to go when the light turns green." And if you're that guy in the pick-up who speeds up and rides the bumper of the car in front of you because it goes against your manly nature to let me merge, worse thoughts about a human being seldom surface in my mind. Oh flesh! "For you were called to freedom, brothers. Only do not use your freedom as an opportunity for the flesh, but through love serve one another. For the whole law is fulfilled in one word: 'You shall love your neighbor as yourself.' But if you bite and devour one another, watch out that you are not consumed by one another. But I say, walk by the Spirit, and you will not gratify the desires of the flesh. For the desires of the flesh are against the Spirit, and the desires of the Spirit are against the flesh, for these are opposed to each other, to keep you from doing the things you want to do. But if you are led by the Spirit, you are not under the law. Now the works of the flesh are evident: sexual immorality, impurity, sensuality, idolatry, sorcery, enmity, strife, jealousy, fits of anger, rivalries, dissensions, divisions, drunkenness, orgies, and things like these. I warn you, as I warned you before, that those who do such things will not inherit the kingdom of God. But the fruit of the Spirit is love, joy, peace, patience, kindness, goodness, faithfulness, gentleness, self-control; against such things there is no law. And those who belong to Christ Jesus have crucified the flesh with its passions and desires. If we live by the Spirit, let us also walk by the Spirit. Let us not become conceited, provoking one another, envying one another." 1. Prefer one another. Jesus Christ has fulfilled the law, and His Spirit resides with us, freeing us to love and serve one another. As much as this means we ought to be as concerned and careful around others as we are for ourselves, this also means we must forgive others when they have been careless or reckless around us. Forgiveness is probably the hardest part of this for us to live out, but it may help us to recall how often we are in need of forgiveness for our own recklessness and how infinitely Christ has forgiven us for our inadequacies. This is not to say we need to be so defensive and cautious that we ourselves become a hazard, but rather drive with the perspective of Christ's freedom and forgiveness on our minds. If we do, we will naturally worship Him by preferring one another on the road. 2. Obey the law. Here we are not talking about the Old Testament Law that Christ fulfilled. Only Christ could obey that Law, and we are pardoned from its chains through Him. Rather, we're talking about the law of our land, which intends to protect us. This is not a law we have to strive hard to keep. Christ has freed us to serve and obey through Him. When we drive in this freedom, we will naturally honor Christ and our earthly authorities by keeping the law. As careful as we are while treading in the "presence of God" in more formal settings (church, etc. ), we ought to tread with such concern as an act of worship everywhere we go, including in the car. 3. Drive by the Spirit. Look at the kinds of words Paul uses to describe walking by the flesh (above). Can you identify? Ashamedly, I can, especially with the language Paul uses at the top of the passage about being consumed. There are times on the road when someone does something so irritating to me, that I'm literally consumed with anger the rest of the car ride. It brings all kinds of stress and discomfort into the car, especially when my wife is with me. Now, look at how Paul describes walking by the Spirit. Love, joy, peace, patience, kindness, goodness, faithfulness, gentleness, self-control...if this isn't convicting in light of driving I don't know what is. Living out this fruit while driving will certainly lead to God-honoring driving and a genuine worship encounter with Him, but it can only happen if we have been made alive to the things of the Spirit, and we choose to walk by the Spirit. Many people view church as "the" place of worship. However, a life of sacrifice - denying self and following Jesus - is tested and proven when we're not "worshiping" at church. It's hard, but we can worship God while we drive. At least once a day I have to sing out loud while driving, "Wor-ship-while-you-drive," followed by the dwarfs' whistle ditty. I literally have to force my flesh into spiritual submission. So, let us remember the fruit of the Spirit while we drive. If they're non-existent, that's a good indication that we're driving (and probably doing other things) in the flesh, and hence, not worshiping while we drive.